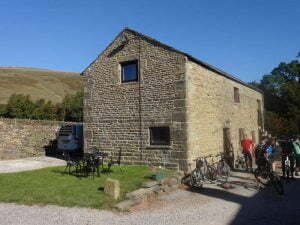 The Stables Bunkhouse is a recent barn conversion situated on our working hill farm, Ollerbrook Farm. The Stables makes a perfect base for your weekend or week-long activities. The bunkhouse sleep up to 16 (14 adult and two child beds). To hire the Stable Bunkhouse for a weekend costs just £460 for exclusive use. Mid week hiring is available at a lower rate. Centrally heated with a dining area and well equipped kitchen. There are three newly refurbished showers and toilets situated both up and downstairs. There is ample space to dry wet coats and walking boots within the bunkhouse and adequate car parking. Secure space is available for bike storage. There is lovely outside sitting area to the rear of the bunkhouse, suitable for BBQ. We have a no smoking policy within the bunkhouse. Sorry – no pets. We also have a small croft at the back of the bunkhouse which would be suitable for extras in the group for camping, for a small additional charge. The village of Edale is less than 10 minutes walk away with a post office and general store and two pubs and two cafes that serve food. 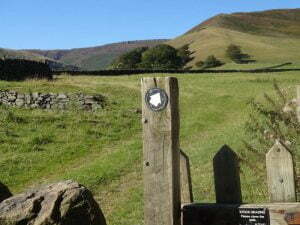 Edale railway station is situated within the village and within easy walking distance of the Bunkhouse. Edale is the start of the Pennine Way and is an ideal base for all outdoor activities including walking, climbing, cycling and horse riding. See the Places to Visit page for more details. All heating and electricity is included. The period of hire commences at 4 pm on the date of arrival and ends at 10 am on the date of departure. The accommodation must be left in a clean and tidy condition; otherwise additional charges may be incurred. The number of people occupying the accommodation must not exceed the limit set by the owners. Please remember that you may be sharing with others if you do not book for sole use. A non-refundable deposit of £100 is required and the balance is due 28 days before the date of arrival. Any Breakages that occur during the stay must be paid for or replaced. Should you wish to cancel your booking, notice either by writing or telephone should be made at least 28 days prior to your arrival to allow re-letting. If we are unable to re-let, the full amount will become due.